Clear cascades, flowing streams, water falls and gorges etch their way through thick lush rainforest surrounding the tropical city of Cairns, offering a variety of natural and cultural experiences. This tourism hub offers easy access to stunning beaches and spectacular dense rainforest mountains. The area can be easily toured by train, car, and bus as well as cable rail, bike and on foot. The Gateway Discovery Centre is situated opposite the sound shell on the southern end of the Esplanade, Cairns. Run mostly by volunteers and supported by Tourism Tropical North Queensland, this centre offers the visitor a regional perspective on places to see and things do in the tropical north Queensland. Address: 51 The Esplanade, Cairns Qld 4870 | 8.30 am to 6.30 pm, 7 days a week. Closed Christmas Day and New Year's Day. 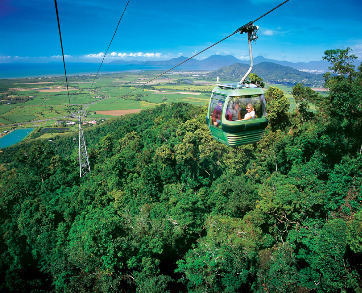 Cairns ZOOm and Wildlife Dome is the world’s first challenge ropes course in a wildlife park, a spectacular all-weather wildlife exhibit enclosed by a 20 metre high glass dome on top of the Reef Hotel Casino. 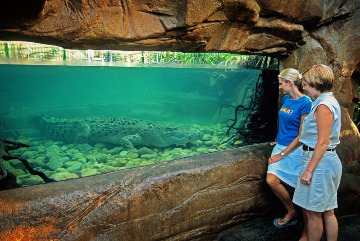 Providing full-day and half-day options, Cairns ZOOM & Wildlife Dome provides a taste of the amazing Wet Tropics rainforest. Embark on a fascinating journey of discovery over and through the oldest continually surviving tropical rainforest on earth with Skyrail Rainforest Cableway. Skyrail offers a truly unique perspective of Australia’s World Heritage-listed Tropical Rainforest as you glide just metres above the pristine rainforest canopy before descending to explore the forest floor at the Red Peak and Barron Falls Rainforest Stations. Kuranda Scenic Railway winds its way on a journey from Cairns to Kuranda, the village in the rainforest, with Freshwater situated along the line with views of the surrounding mountains. Rising from sea level to 328m, the journey to Kuranda passes spectacular waterfalls and into the stunning Barron Gorge. 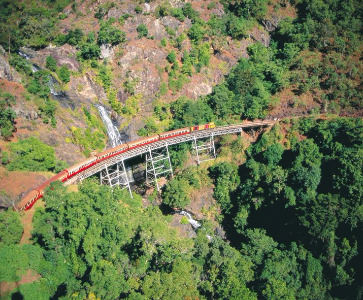 Upon reaching the village of Kuranda a rich assortment of interesting attractions and unique shopping experiences awaits.